Bikini Bottom Dump – From SpongePedia, the biggest SpongeBob-wiki in the world! 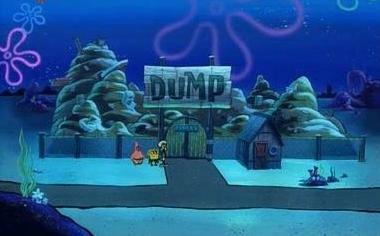 The Bikini Bottom Dump is a dump that is seen in Artist Unknown, Idiot Box, Wigstruck, and The Lost Mattress. In Artist Unknown, SpongeBob hides in a Cereal box from Squidward because he thinks that his Art isn't good enough.The trashfish is one of the employees. The Bikini Bottom Dump looks like any dump. It has mountains of trash and is guarded by a guard worm. It is covered with garbage waste like old pies, SpongeBob's box (by accident), rotten apples, and Squidwards old painting, Bold and Brash (AKA Belongs in the Trash). There are also tall metal gates surrounding the area. Bikini Bottom Dump is a huge pile of trash.It is guarded by a large worm. In Wigstruck, it appears in background. It is near to Floaters Cemetery. Maybe the Bikini Bottom Dump is in Conch Street (main street in Bikini Bottom). This page was last modified on 16 November 2012, at 19:57.